Yesterday, the McClain Special Needs Advocacy Group issued a press release holding Disney Parks accountable for a poorly implemented and inadequate Disability Access Service policy. Many throughout the disabled community are hopeful that this catches the attention of Disney executives sparking the initiative for adjusting this new program to include the accommodations that were present in the previous GAC system. At the end of the day, they haven’t really removed the ability for individuals to commit fraud in the new program, instead they’ve removed accommodations that thousands of families relied upon for decades – making the DAS less appealing to anyone with unethical intentions. Many people express the willingness to share medical or educational records ahead of time in order to truly reduce fraud. This could be easily achieved with the implementation of a pre-registration database. However, Disney has maintained a stance that they are prohibited by law to review such official documents. These families feel as though Disney does not care to listen or consider their needs. Where Disney was once a place of magic and sheer joy, the name now resounds with a harsh reminder that another part of our world no longer recognizes the unique needs of the physically and cognitively disabled. It’s very sad. You can read the press release here. (Don’t forget to share it, like it, post it – everywhere for maximum impact! If you’re able to attend the protest in Anaheim this Saturday, get full details on Kim McClain’s Facebook page. 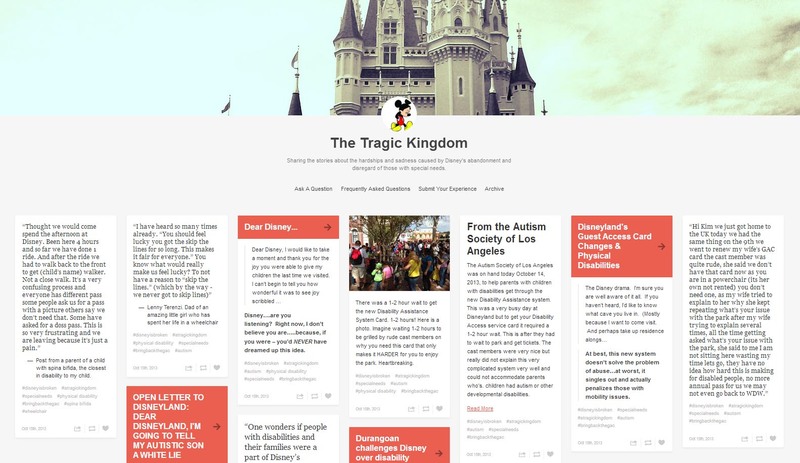 Have you visited http://www.atragickingdom.com yet? Try it out! You can learn more about recent experiences with the new DAS and voice your own opinion too!